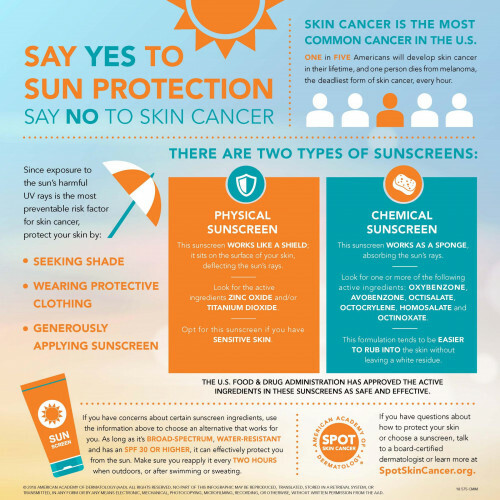 SPF 30 or Higher: Choosing a sunscreen with an SPFof 30 or higher is recommended by the American Academy of Dermatology. Water Resistant: Choosing a "water resistant" sunscreen means that it will stay on wet or sweaty skin for a while before you need to reapply. "Water resistant" suncreen usually lasts 40 or 80 minutes, and not all sunscreens offer water resistance. 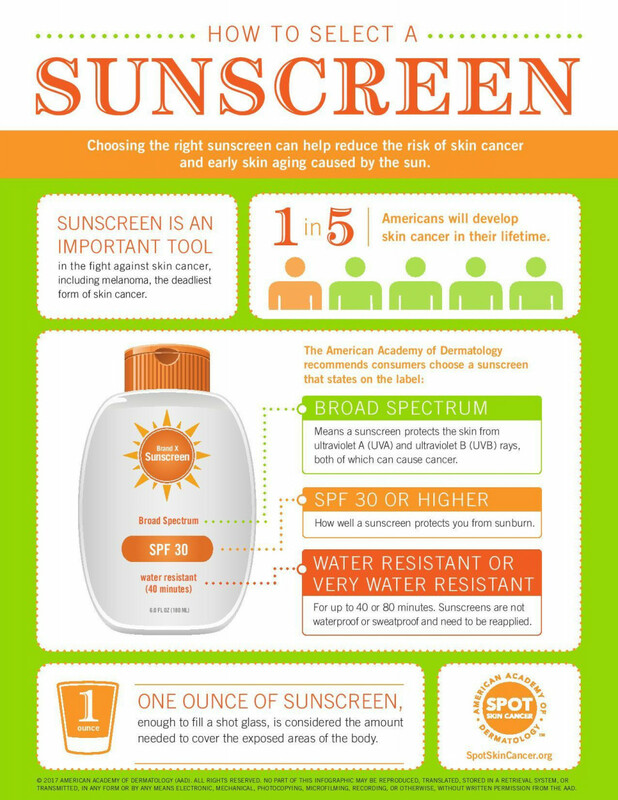 How well your sunscreen protects you can depend on how well you apply it. Generously apply sunscreen before you plan on spending time outdoors. For proper protection, apply sunscreen 15 minutes before heading outside as your skin needs time to absorb the sunscreen. Even on cloudy days and during the winter your skin is exposed to the sun's harmful UV rays, so it's important to remember to apply sunscreen. Cover all exposed skin. It usually takes about 1 ounce (enough to fill a shot glass) of sunscreen for an adult to fully cover their body. When applying sunscreen make sure to thoroghly rub it into your skin. Don't forget to remember areas like your lips, neck, face, ears, tops of your feet, and your scalp. Use an SPF of at least 15 when applying lip balm to your lips, and for hard to reach places like your back, ask for help when applying sunscreen. Reapply sunscreen every 2 hours or immediately after swimming or sweating. Using an expired product, not reapplying sunscreen, or not using enough sunscreen in the first place are all reasons for sunburns.